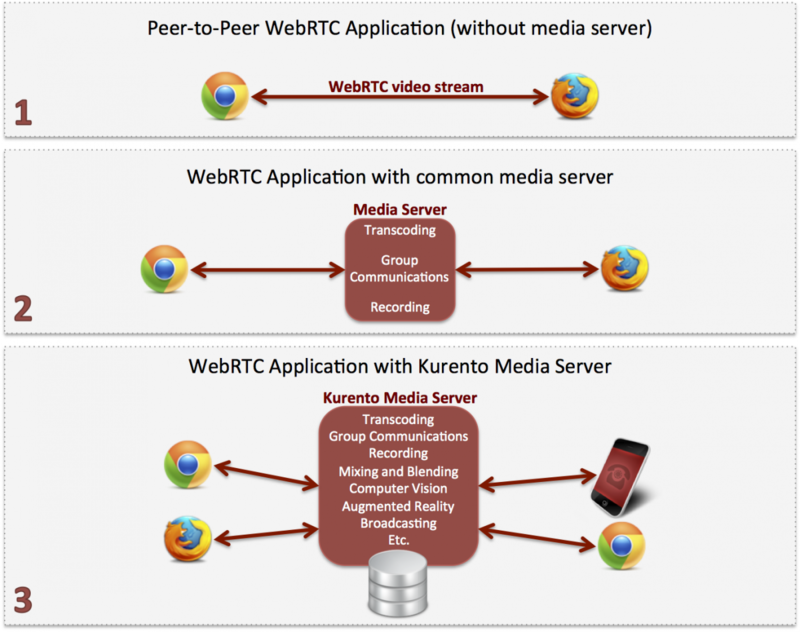 Kurento is a WebRTC media server and a set of client APIs making simple the development of advanced video applications for WWW and smartphone platforms. Kurento Media Server features include group communications, transcoding, recording, mixing, broadcasting and routing of audiovisual flows. As a differential feature, Kurento Media Server also provides advanced media processing capabilities involving computer vision, video indexing, augmented reality and speech analysis. Kurento modular architecture makes simple the integration of third party media processing algorithms (i.e. speech recognition, sentiment analysis, face recognition, etc. ), which can be transparently used by application developers as the rest of Kurento built-in features. Kurento Media Server adds advanced media processing to the capabilities of common media servers. Our vision is crystal clear: to democratize multimedia technologies helping all developers to include advanced multimedia capabilities into their WWW and smartphone applications in a simple, direct and fast manner. Let Kurento deal with complexities of multimedia. Just concentrate on your application logic. If you are one of such developers that just want to have things done, Kurento may be of your interest. We want developers to feel that multimedia and real-time communications are just another API as simple and as pluggable as the ones used for other purposes such as accessing databases, executing Web Services, parsing JSON, etc. All Kurento technologies are released as Open Source Software. No locking, no adoption barriers. Decisions in Kurento are driven by a principle: simplicity. Kurento APIs have evolved through this principle. Kurento technologies are only based on standards. You won't find proprietary limitations or vendor locking. Kurento development model is fully inspired on how Web development works. WWW developers will find it natural.